← Is it all sweet FA?? When one looks at these words, there is a presupposition that typifies them all – that ‘different’ parts have come together to form something new, distinct and unique. In the article entitled; “How is Diversity connected to business strategy?, Part 2”, we had discussed the idea that a core connection between diversity and business strategy is businesses’ strategic need to remain competitive. Competitiveness or the development of a competitive advantage or edge, is all about creating a product backed up by solid intellectual capital – derived from the coming together of different ‘intelligences’ in order to create something new, unique and distinct. Becoming ’more joined-up’ is the word that we tend to wilfully use to describe greater inclusive working these days. Indeed, being ‘joined-up’ has become even more imperative, for both large and small organisations, more so as changing customer needs continues to drive the kind of skills, expertises and experiences that organisations need in order to meet demand. Being ‘joined-up’ is not just about using IT services to centralise the different systems and processes of an organisation. It is also about creating a culture where working in synergy is understood, both individually and collectively, to be the absolute source of getting the best out of everyone – and as a consequence, creating, developing and sustaining a competitive advantage. Becoming more ‘joined-up’ as a business, or working in an inclusive environment, is not just a behaviour to be learned given the competitive impact it has – as described above, but importantly, is a requisite behaviour that Leadership must demonstrate to ensure a greater ability to achieve strategic business objectives. Otherwise called the concept of ‘Organisational Agility”, ‘inclusivity’ and ‘joined-up’ working are actually all about the ‘capability’, ‘flex-ability’ and consequent ‘elasticity’ an organisation naturally has, to be innovative and able to respond to changing customer need – based on the inter-connectedness of its diverse range of people skills, abilities, experiences, backgrounds and socio-historical contexts. ‘Inclusivity’ is a word that, traditionally, has tended to get lost in the politics of ‘equality’, ‘equalitisation’, and ‘equity’ related issues, issues which historically have been connected with the creation of structural and systematic biases that we, unfortunately, as humans are products of. 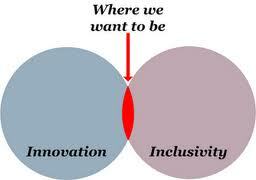 It’s time to let this thinking go and put ‘inclusivity’ at the heart of business. Indeed, it is imperative that we do, so that we are not distracted from unlocking the competitive edge that it brings. Jude-Martin is Director of Diversity is…a consultancy focused on providing a fresh and innovative approach to diversity through the provision of HR services covering Strategy, Assessment, and Development for ensuring effective people management in the 21st century global business context. I so enjoyed your entries here Jude. Your perspective is fresh and collaborative. I have been pin the intercultural-diversity business 20 years and rarely see something as positive-clear yet not pollyannaish. Many thanks for your kind thoughts expressed above. They are very much appreciated. I think you are absolutely right to suggest that diversity, and diversity services in general, are best served by taking a more thoughtful, fresh and collaborative approach. Do let’s stay in touch. Are current diversity awareness programs really delivering return on expectation? It’s reported that 120 police officers are on suspension in England over different allegations. The latest is The Met’s suspension of eight officers and a civilian worker as part of an investigation into 10 separate allegations of racist abuse, bullying and violence involving 18 officers and one staff member. It is because of a college class I am taking that I stumbled onto your blog. I am sad to say my organization faces the same silo-ed feelings and the staff’s spirits are broken… I just assumed past issues have created this and it has become our new normal. I am encouraged to bring a new way of thinking into my department. “Joined Up” “Organizational Agility” how can I bring these concepts and capabilities to each person I work with. We all need to really appreciate the inter-connectedness of our diverse people, their skills, abilities, experiences and backgrounds.